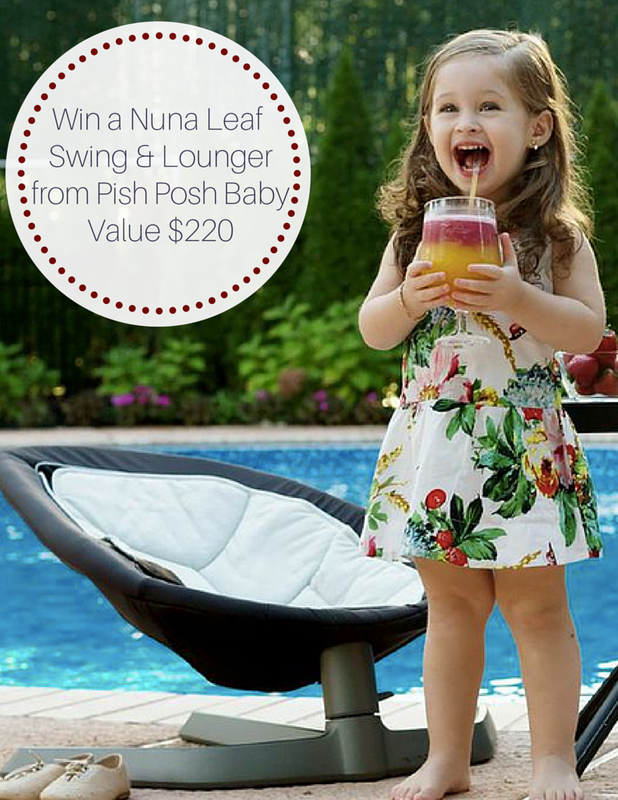 We're giving away this sweet Nuna Leaf Baby Swing & Lounger! It's great for babies & toddlers alike to sit and swing for a bit or just kick back and read a book. Thank you Pish Posh Baby for sponsoring this amazing giveaway! I would love to win this for my bubbly little 4 month old. She could use this beautiful swing for years to come! We are expecting our first, and would love to win the Nuna Leaf. I saw it a few weeks ago at a baby event, and immediately loved it. thanks for the chance. Wish this was around for my first baby, it looks so comfortable and sleek. Baby #2 will be here in Feb, so it would be perfect for her. And my toddler can use it sometimes too. I'm expecting my first this would be great for him!! I would love to put future baby Hendy in his little pod! It would be a great gift for my friends who are having babies! I'd love to win this since I know that my daughter would love this. Thanks for the giveaway! I'd love to win this because I just found I am pregnant with #3 and this would something that baby would have that the first two never did (especially considering everything else will be hand me downs). I would love for this to be the first item we place in our currently empty baby room...1st baby! I would love to win this for my little girls! This is awesome! It's absolutely adorable, stylish and looks super comfy! We would love this for my new little! We don't have a swing or bouncy seat currently. I would love to win this! I've had my eye on it for awhile! I would love this because I am expecting my first baby in a few days! Thank you!! I think my toddler would love this! Its a piece of baby gear for the little one on the way that he can actually use! We love nuna! We have the pipa and Sena and I desperately want the leaf for my little boy. I love that it lasts forever! Nuna LEAF has been on my top wishlist for my baby girl arrival ! This would be awesome because it could be used by my baby and my tot and not take up to much space! I'd like to win this prize bc this would be great to have for our first and bc it would last not only through our first but as they grow older and for any other kiddos that follow! I'd love this prize because I'm expecting my first baby boy in March and winning this would be a blessing! Baby on the way! February 2015. Would really be a great help in saving some $$! My son will be born early next year and winning this prize would be such a blessing. With a toddler in tow, having to move a month before our baby is due, and being high risk, our budget is pretty tight. I really hope I win! I would love to win because I am expecting baby #2 and have a toddler. There are a lot of other baby chairs on the market, but most have a very low weight limit. I want something that won't break when my daughter sits in it (like I know she will!). What an innovative product - no batteries, no electricity, just baby's weight propels it. Do they make these for adults :). Also, baby can use until he is 130#..Wow! No surprise as to why I would love this prize. I am expecting baby #3. He is due to arrive in exactly 1 week !! I love Nuna products !! and would LOVE LOVE LOVE a leaf. I would love to win this prize because I'm due next month and this sleek piece looks like it is both functional for a baby as well as a beautiful piece in a room! There are so many things I love about this chair! It's been on my wishlist for quite a while. Love that it requires no batteries and has such a neat design. Also love that it can be used well beyond the baby stage. It looks like a great baby gear addition to any home. Thanks for the chance to win! this chair can grow with your child and its completely non toxic! I would love to win this prize because I am due with baby #4 in June and would love some new to baby items and not just all the hand me downs we have. As the Program Director for a non -profit I am pretty busy and SUPRISE I am having my mid life baby ( a girl yipppe London Nicole) about 8 weeks before my center starts its Summer Academic Enrichment Camp for 150 under privileged inner city youth. Needless to say its all staff on deck and I will not be taking much of a maternity leave, this set would be perfect for the 3-4 days I will have little London in the office! Regardless this site rocks, good luck ladies!!! My husband is gone, the Army, at the moment and our youngest is not sleeping at all: so any little thing to help would be amazing. My oldest would appreciate it as well because he thinks Mommys too busy with the baby! I'd love to win because we'll be welcoming baby #5 next month and I've heard such great things about the Nuna Leaf. I think this would be such a great addition when we welcome our baby and over the years! I'd love to win for a friend! I would love this because my son loves lounging and I love that he can use this for a very LONG tim! I would love to win for my little guy who is due to arrive in March! I would love to win this for my baby boy. I love all Nuna's products. My baby girl is due in January. She would love this rocker! I would love to win this to use with our new baby! Thank you for the chance! This would be great for baby #2 due in May as I sold most stuff from my first! I would love to win this for me second baby due in March! I love the sleek design. I would love to win this for myself (due next month) and my sister (due in the summer)! Hopefully we can both use it! Our swing got ruined in storage and we'd like to have another kiddo soon. This would be so great!! I am due next month so this would be perfect for my little family to be. I'd love to give it to my niece who is expecting her first baby. Love the features and neutral design of this! Would make any baby happy! My brother is having his first child and this is perfect! It is just absolutely adorable! I am expecting in March and will have two little girls under the age of 2 and the nuna Leaf would be a lifesaver!!! I would love to win this nuna for my first baby and it would make it so special! Love Nuna and would love to win one! I'm pretty sure Facebook logs me in as Brittany S for my maiden name! My little one loves movement for her naps, so this would be a great swing to have. I already have the Nuna Sena, and it has been such a great product! I would love to win this for my baby girl. What I love so much about the Nuna Leaf is that it can be use for years as the child grows and not just for a certain stage. It would be so awesome for our little one to have a comfy place to read her books or just relax after a busy playdate! My toddler would love this! Because my baby needs one! Love nuna products!! Looks like a fantastic way to get my baby to sleep! I would love to win this for both of my kiddos to use. I love that it grows with your child, so both my toddler and infant can enjoy it! My littlest is almost out of the swing phase, so this would be a perfect transition! Plus, it's SO stylish looking - it would look fantastic in any room of the house! What a wonderful gift this would be for my granddaughter! This would be perfect for my new baby boy! I would love to win this for my little one that is due soon! Would love to win this for our little bebe due next month. Love the modern, sleek look!